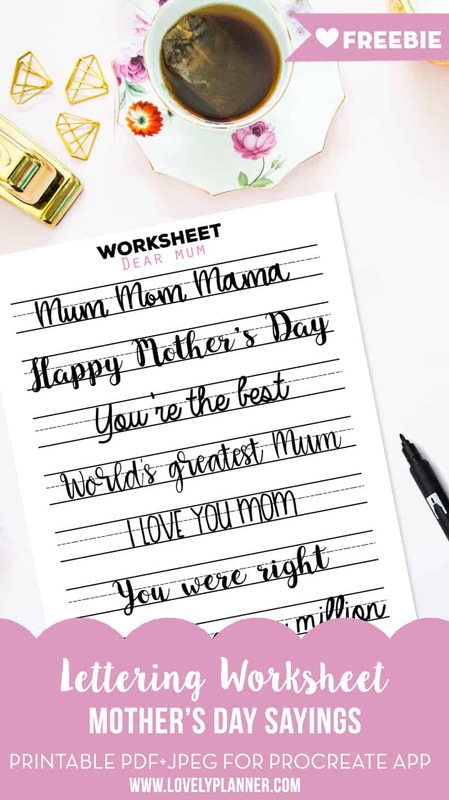 Mother’s Day is coming up so I thought this “Dear Mom” lettering practice worksheet would be a good way to help you practice your hand lettering skills and master a few sayings to maybe embellish a card or gift tag for your Mum on her special day! To celebrate the launch of my 5th workbook, I’m happy to share with you today a printable worksheet (not included in the workbooks) with Mother’s day related words in the 5 different lettering styles. Sort of a sample of the 5 different lettering workbooks I’ve already created if you will. 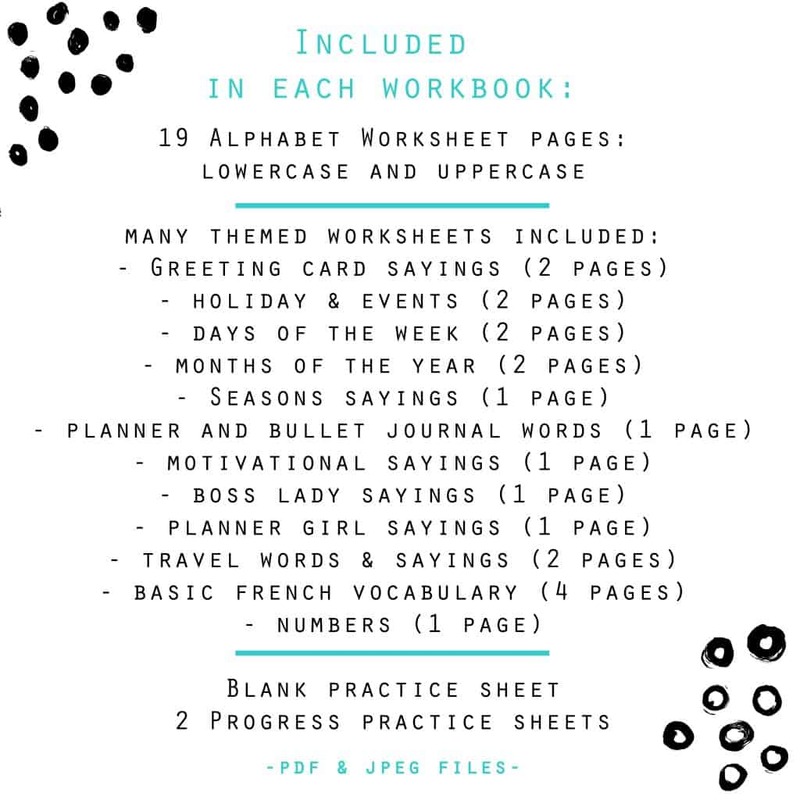 Each workbook includes +40 worksheets to practice your hand lettering and help you make all your planners, bullet journals, study notes, cards and whatnot prettier! 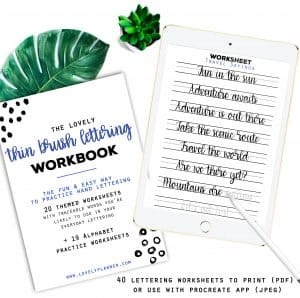 ►Brush Lettering Workbook: Brush Pens such as Tombow Dual Brush Pen (brush tip), Pentel Fude Touch Brush Sign Pen, or even Crayola Markers or Crayola Super Tips. 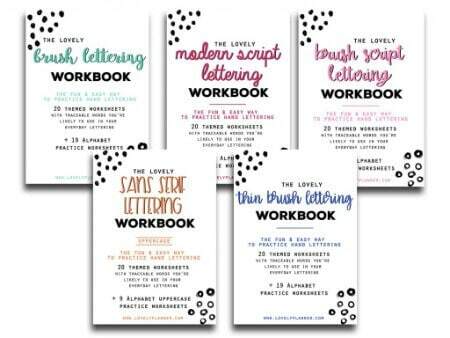 If you want to master different types of lettering and get the most bank for your buck then you may be interested in purchasing more than one workbook at once – the more you buy the more you save (from 25% to 45% savings). You get to create a bundle of 2, 3, 4 or even 5 however you’d like, by adding the workbooks you’re interest in in your cart and then adding the appropriate discount code before checking out! What’s included in these workbooks and why should I get it? postcards, gift cards, scrapbooking pages, craft projects, etc. 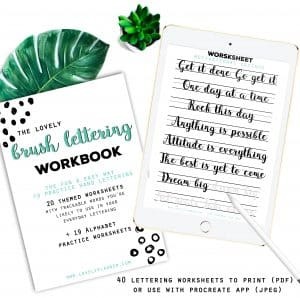 Each Lettering Practice Workbooks include more than 40 pages to help you get started or improve your hand lettering in a fun and easy way. The content in each workbook is the same but the lettering style is obviously different. Even though I’ve included alphabet practice worksheets in these workbooks (19 worksheet pages, except for the Sans Serif Workbook which is only Uppercase and as such only has 9 alphabet pages), I made it a point to include a lot of worksheets (20 different worksheets) featuring traceable words & sayings you’re likely to use in your everyday lettering. 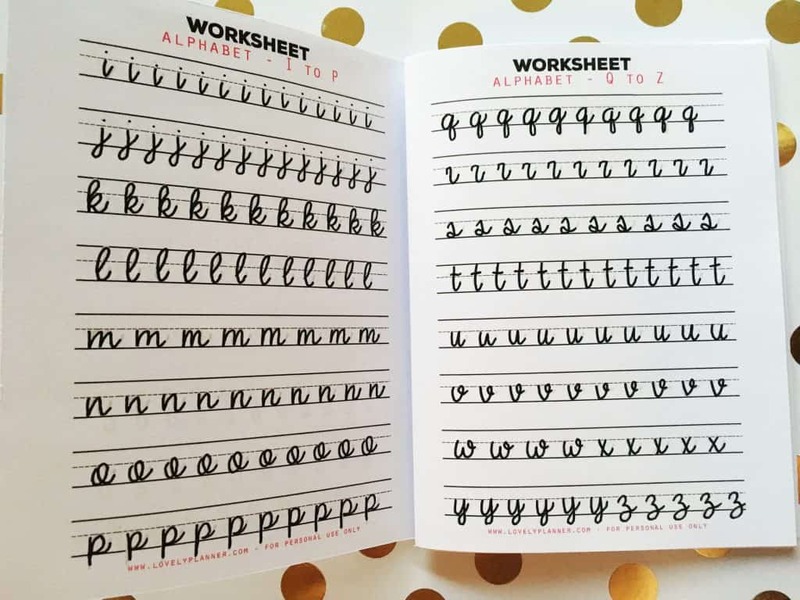 While practicing each letter on its own (alphabet worksheets) is a useful step in the process, for some people, it isn’t the most fun thing to do. Practicing letters on their own doesn’t mean you’ll do a great job at forming nicely written words with these letters. Which is why I believe that this big pack, including themed worksheets in 2 different lettering styles is a good choice for beginners and people who want to see quick results while keeping it fun! 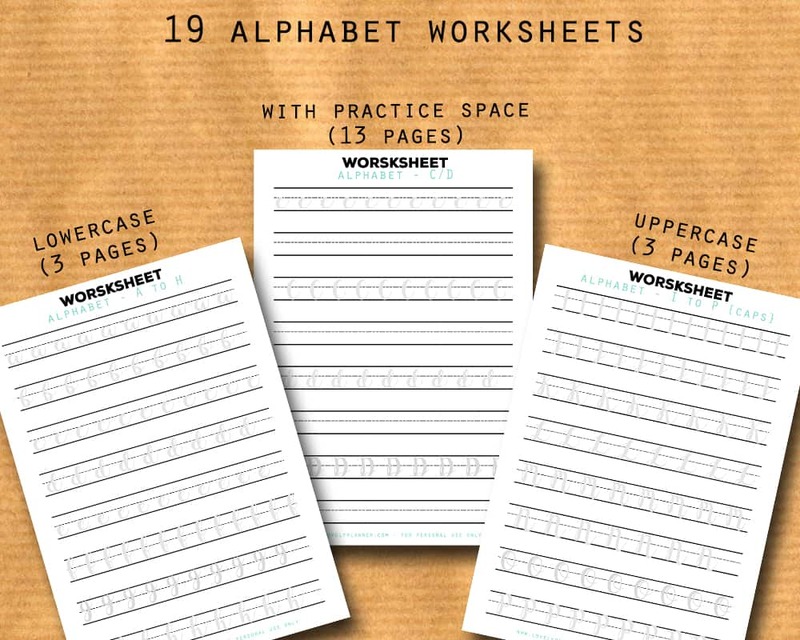 Practice each letter on its own with the lowercase and uppercase worksheets included. Each workbook also includes a blank worksheet, as well as 2 progress worksheets to compare your hand lettering before and after completing the workbook. 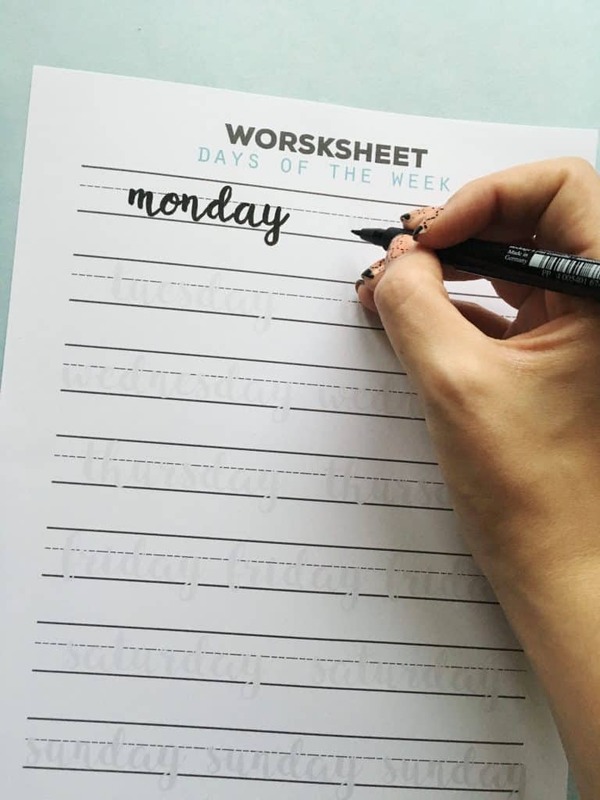 I also share tips and recommendations to use the workbooks (pens recommended, printer settings to print on A5/Half US letter or A4/US letter). 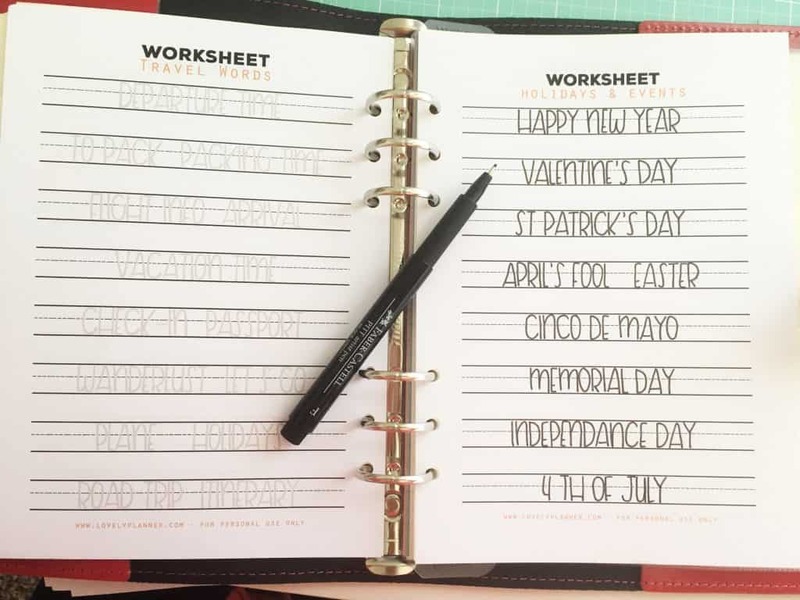 Before you know it, you’ll be able to hand letter all the words and sayings your heart desires without the help of worksheets. 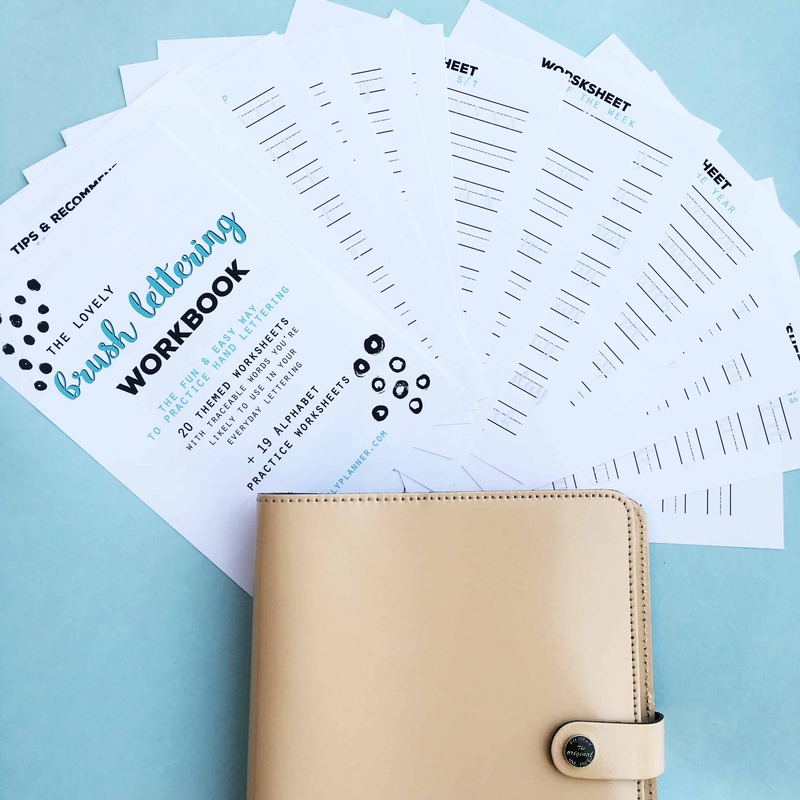 Of course you probably want to test sample pages before ordering these workbooks. 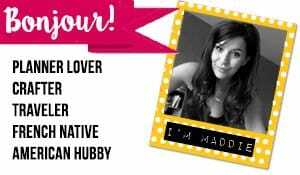 So here you go ! Depending on the printer settings you’ll select, you can get A5/Half US letter inserts or get a full page (A4 of US Letter) worksheets. To get A5 inserts (or half US letter), I advise you cut your paper to A5 or Half US Letter and select the corresponding format in your printer settings, and select scale “fit to page”. If your printer has a “booklet” printing settings, then you can also print it as a little booklet. I did that for the Modern Script Lettering and Sans Serif Lettering Workbooks and I quite like this system! Alternatively, I’ve also included JPEG files so that you can use these lettering worksheets with Procreate App and Apple Pencil on your IPad Pro if you’d like to. 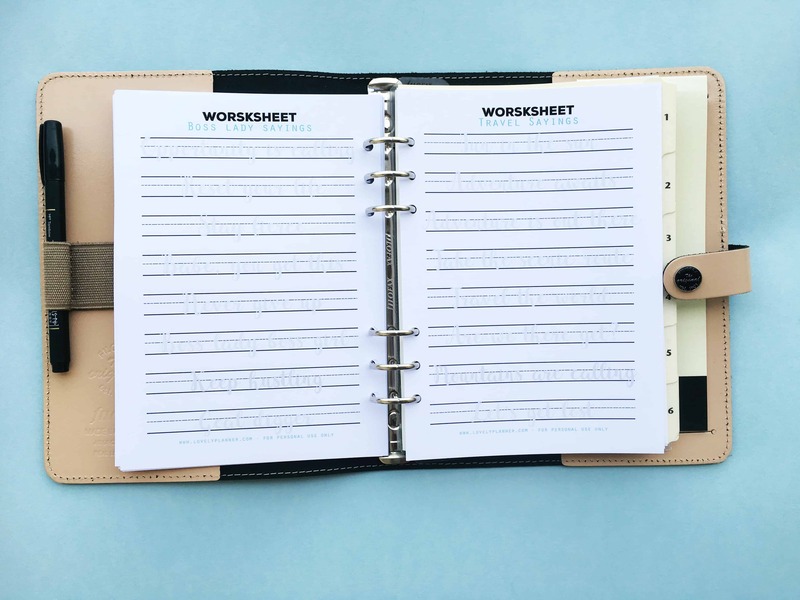 A5/Half US Letter size is the perfect format if you want to add the worksheets as inserts in your A5 Planners. This way you can practice at any time and easily access them for future reference. 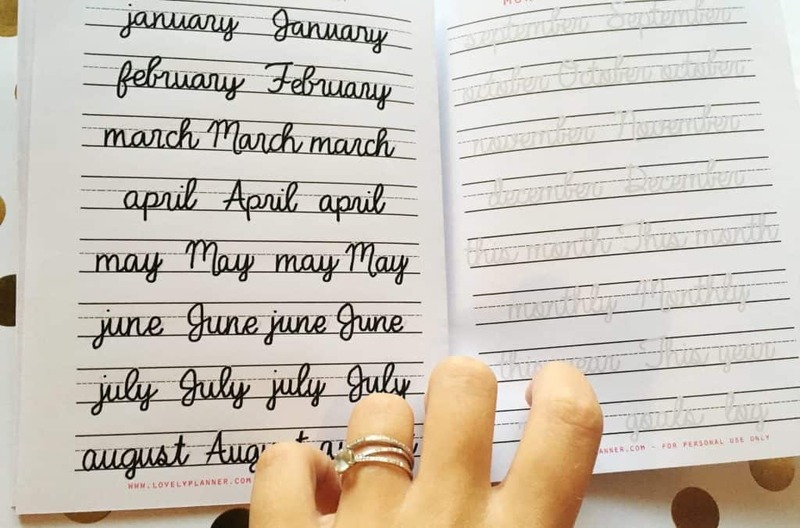 Plus, the A5/Half US letter size is a good dimension to practice because the size of the words is about the same size as your handwriting in your notebooks, journals and planners would be. 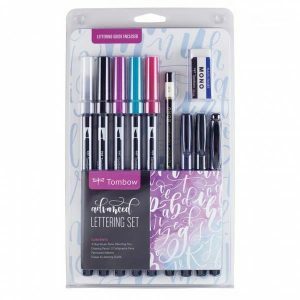 Whatever the format you choose to print on, you can check out these Tombow lettering sets that could help you get started: Advanced and Beginner sets. 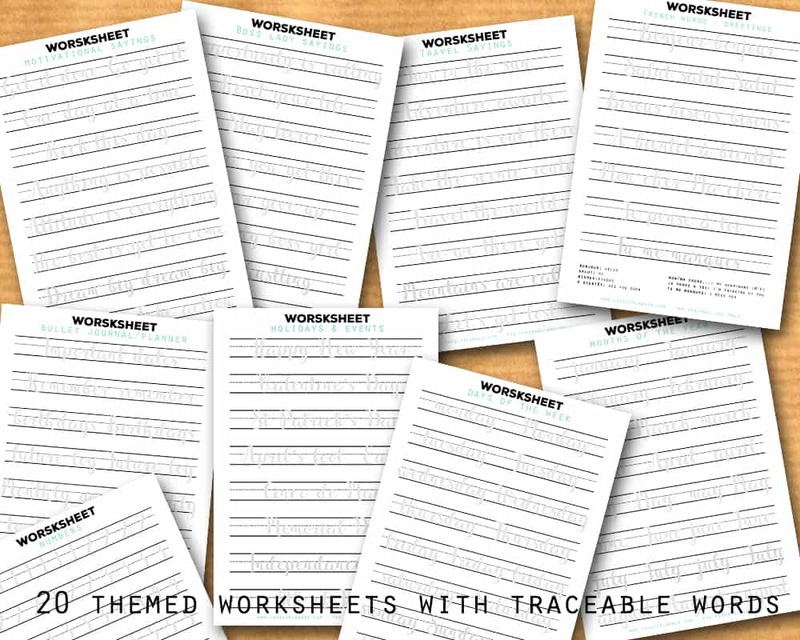 If you have an Ipad Pro or the new Ipad 2018 (both are compatible with Apple Pencil) you can also use these worksheets with the Procreate App and Apple Pencil (JPEG files are included in a ZIP folder). You’ll simply have to extract the Zip folder and import the JPEG files in your Procreate App, add a layer on top and start tracing the words!